To continue visiting our website, you should accept this policy. 5% discount for orders over 50€, + extra 6% discount if you share our products on social networks! 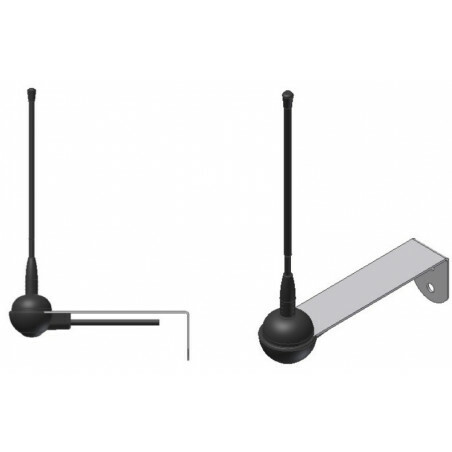 Multifrequency universal door opener which permit to activate an electric lock or electric strike plate, using almost any remote control in the market, both fixed and rolling code, AM and FM, which transmit in the frequency 433.42, 433.92, 434.15, 434.42, 868.3, 868.5, 868.8, 315 or 418 MHz. Can be installed in 5 minutes! 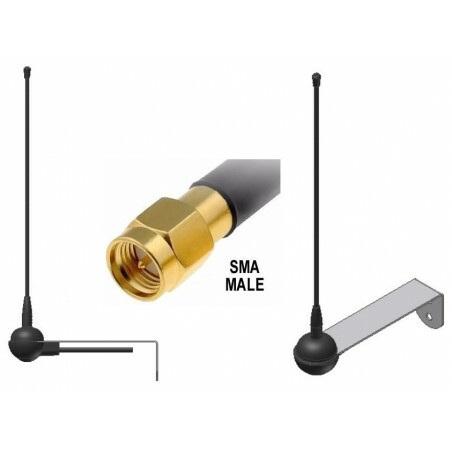 This very small device, only 29x29x10mm, can be used with almost any radio remote controls in the market which transmit in a frequency between 288 MHz and 868 MHz, AM and FM, fixed and rolling code. Also, it can receive in one or two different frequencies, even with different modulation. When a known code is transmitted by the remote control, Creasol UniLock shorts the supply wires, simulating a pushbutton: in this way it permits to open an electric lock or electric strike plate by using any existing remote control in the market that was programmed on this receiver. 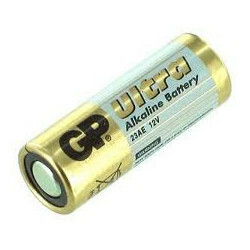 It can be used with electric lock supplied at 9&div;18Vac or 9&div;24Vdc, with current from 0.8 to 3.2A. It's very easy to be installed: only two wires that should be connected in parallel to the pushbutton switch used to activate the electric lock. No need for external supply or battery! Fully configurable by the user: the operating frequency, shown in the table, can be simply programmed using the Prog button, as like as the number of activating pulses (1, 2, 3, 4) and their duration (100ms, 200ms, 400ms, 800ms). 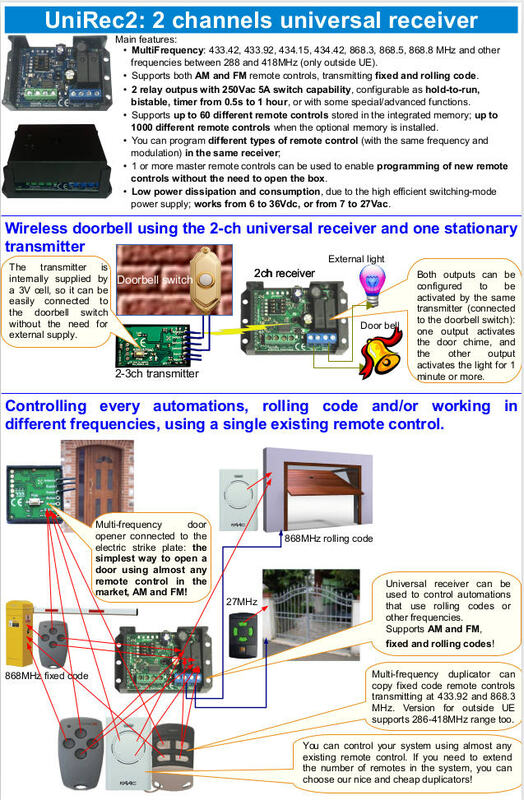 In the same door opener it's possible to learn up to 60 different remote controls, even if different brand/model, both fixed and rolling code, AM and FM: the number of remote controls depends by the code complex, so, for example, it's possible to manage 60 12bit remote controls or 40 KeeLoq rolling code remote controls. 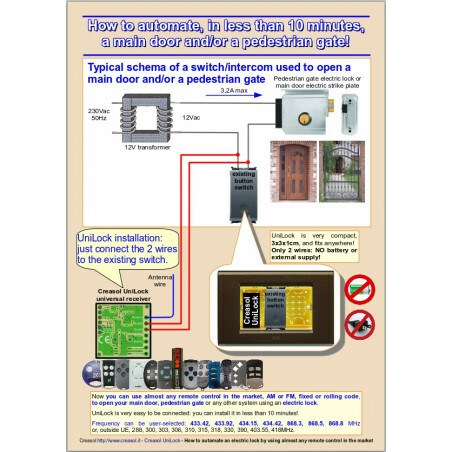 open your entrance door, installing a Creasol UniLock device. So, with your existing remote control you can easely automate your house. Also, you can extend the number of remote controls using our Creasol Four and Creasol Multi remote control duplicators. The product is made in Europe, provided in a nice transparent resealable recyclable clamshell, with instructions printed in several languages. We also offer any customization to companies that like to purchase at least 100pcs: please send inquiry by email to sales@creasol.it , specifying company details and special requests. Frequency selected by the user: 433.42, 433.92, 434.15, 434.42, 868.3, 868.5, 868.8, 315*, 288*, 300*, 303*, 306*, 310*, 318*, 330*, 390*, 403.55*, 418* MHz. Frequencies marked with * cannot be used inside EU. 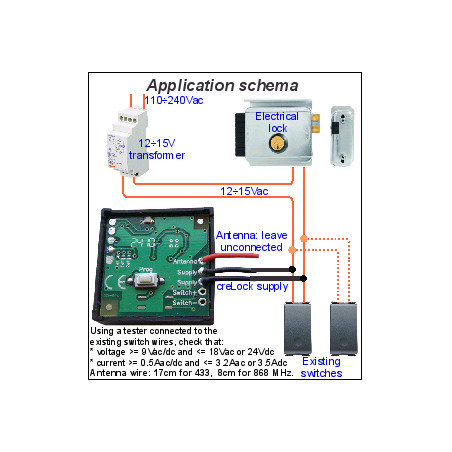 The frequency of the remote control must be stable, so it does not work with remote controls without crystal or saw resonator (some bad remote controls operating around 300 MHz)! 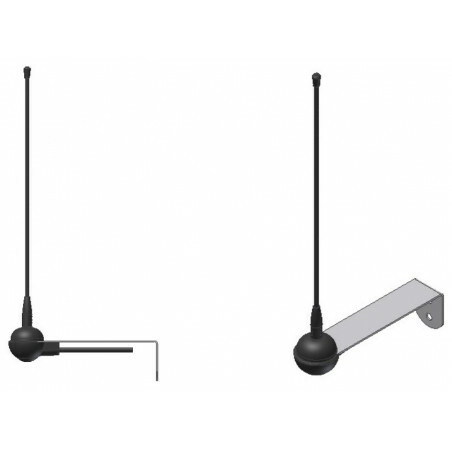 Twin frequency receiver: the user can select one or two frequencies/modulations as preferred, so it can receive, for example, at one single frequency or both 433 MHz OOK and 868 MHz FSK, or both 868MHz OOK and 315MHz OOK, or any combination of frequencies. 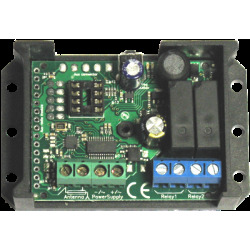 Works with a wide range of remote controls which transmit fixed or rolling code. See the compatibility table. Manages different types of remote controls in the same time. It's possible to learn one or more "master remote controls" that can be use just to enable learning for 10s without the need to access the receiver to press the Prog button. 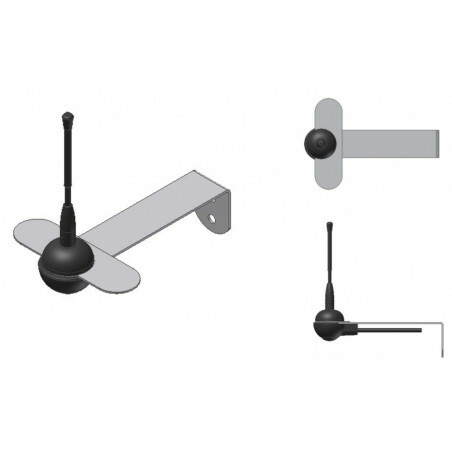 This device has 3 wires, one of which is used as antenna and should not be connected anywhere. Two wires should be connected to the existing switch, so a little current (20mA) will pass through the electric lock supplying Creasol UniLock. Check the voltage on the existing switch: it should be in the range 9÷24Vdc or 9÷18Vac. Connect the 2 wires marked as Supply in parallel to the existing switch. Configure the frequency you wish to use, pressing Prog button for 5 times: LED shows the current programmed frequency, for example it flashes twice to indicate 433.92 MHz. Then press again Prog button N times, as indicated in the frequency table (for example 3 times for 868.3 MHz). Configure the number of pulses, pressing Prog button 6 times: LED flashes to indicate the current configuration. Press Prog button again to set the desired number. Configure the pulse length, pressing Prog button 7 times: LED flashes to indicate the current configuration. Press Prog button again to set the desired length. Press the Prog button twice to enable learning mode: then it's possible to press a button on the existing remote control, within 10s, to learn it. Every time a new code is learned, the 10s timeout is reload. LED flashes 2 times if the remote control has been learned, 3 times if it was already learned, 6 times if memory is full. Press the Prog button 3 times, then it's possible to transmit, within 10s, from the remote control that need to be removed: LED flashes 4 times indicating that the remote control has been removed. Alternatively, to blank memory (remove all remote controls), press Prog button for 10 times, LED flashes 10 times, then press again Prog button 3 times. Press the Prog button 4 times and follow the same procedure to learn remote controls: in this case it's possible to learn one or more "master" remote control, which can be used only to enable the learning procedure remotely, without the need to press the Prog button. Note that "master" remote controls do NOT activate the door opener output. To learn new remote controls in this way, put the "master" remote control in trasmission for 1-2 seconds, then start to transmit for 1-2 seconds from the new remote controls: every time a new remote control is learned, the 10s timer is reload to permit successive learnings. Be sure that your remote operates at 433.92MHz! SEARS CRAFTSMAN 300.000 Chamberlain 300MC (multicode) 1 Not still supported! 315.000 Liftmaster 333LM 1 Not still supported! Liftmaster 360LM, 362LM, 363LM 1 Not still supported! 390.000 Liftmaster 50CB, 53CB, 750CB, 753CB, 50LM, 53LM, 61LM, 62LM, 63LM, 139.53100, 139.53110, 139.53200, 139.53210 1 Not still supported! LiftMaster 54CB, 756CB, 54LM, 64LM, 859CB 1 Not still supported! LIftmaster 850CB, 853CB, 959CB, 81LM, 82LM, 83LM, 84LM, 99LM 1 Not still supported! 33LM 1 Not still supported! 418.000 4180, 4182, 4183 1 Not still supported! 4185 1 Not still supported! 433.920 4330E, 4332E, 4333E 1 Not still supported! 4335E 1 Not still supported! Note: we can NOT guarantee that it can be duplicated, because it depends by the receiver. 1 Not still supported! Note: only RED buttons model can be duplicated! 433.920 Elca IRIS, IRIS 9CH. Eldata Easywave RT37E5001-01-02K, RT37E5001-01-22K, RT22E5022-01-23K 40 3 3 Work very well, Long range! 40 3 3 Work very well, Long range! Eldat Easywave RTS09E5002-01-02K 40 3 3 Work very well, Long range! Eldat Easywave RTS39E5003-02-23K 40 3 3 Work very well, Long range! GTO 318.000 GTO Mighty Mule 1/2 buttons, RB741, RB742 1 Not still supported! GTO Mighty Mule 3 buttons, RB743 1 Not still supported! HEDDOF 318.000 P219-1, P219-2 1 Not still supported! P220-1, P220-2, P220-3 1 Not still supported! LEGRAND 433.920 Legrand CAD 48900, 48901, 48903. 310.000 Linear Delta3 Moore-o-Matic: DT, DT2, DT2A, DT22A, DTC, DTD 60 9 1 Not still supported! Linear Delta 3 Moore-o-Matic: DT3, DT4 60 9 1 Not still supported! Delta 3 Moore-o-Matic: Mini-T LB "LadyBug" 60 9 1 Not still supported! PULSAR 318.000 9931-318, 9931T-318 1 Not still supported! 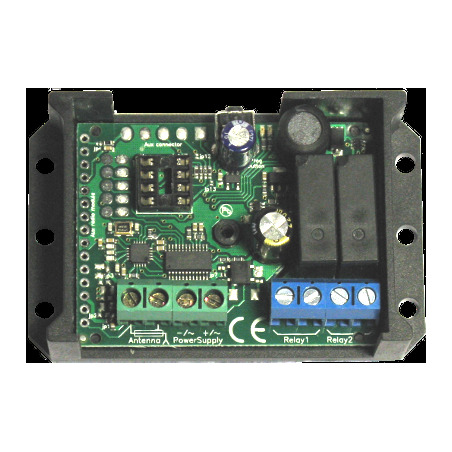 QUICK 433.920 Quick Gangway transmitter. Marine remote control for yacht. SICE 433.920 TX4 CLACK Bigfoot 1 Not supported! 318.000 Skylink Mltilink PD-318M 1 Not still supported! (versions compatible with Chamberlain) 1 Not still supported! diff. colors 1 This is a compatible remote control: please look for the compatibility of the original retmotes! 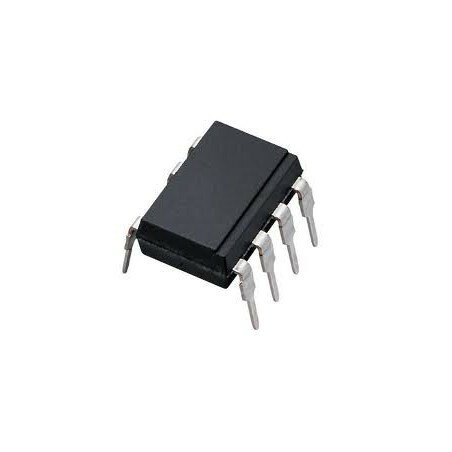 868.300 V2 PHOENIX series: Phoenix2-868, Phoenix2P-868, Phoenix4-868, Phoenix4P-868. Transmission frequency must be accurate and stable: it means that the original remote controls has a transmitter circuitry which frequency may be NOT accurate. 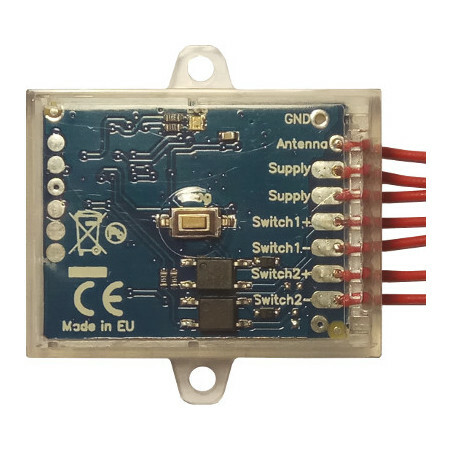 Because the universal receiver has a good selectivity (narrow bandwidth), it may not work with bad transmitters that are not stable in frequency, while it works well with our remote control duplicators MULTI, MULTI-ST, FOUR, SENDER, SENDERBATT. Range measured with UniRec2 connected to 25/17/8cm wire antenna, eye-of-sight condition. added modulation OOK with narrow bandwidth, to get higher sensitivity: can be used only with remote controls with good frequency stability. added DUCATI ALLDUCKS rolling code management (thanks Gaetano). UniRec2: added menu 7 to configure the relay outputs as: 1=normally open (default); 2=normally closed; 3=electric lock before open (when a valid code is received, the output will be activated and after 250ms even the other output will be activated. This is useful when an electric lock should be activated before activating the motor that opens the door/gate); 4=off before on (before activating the output, the other output should be disabled. 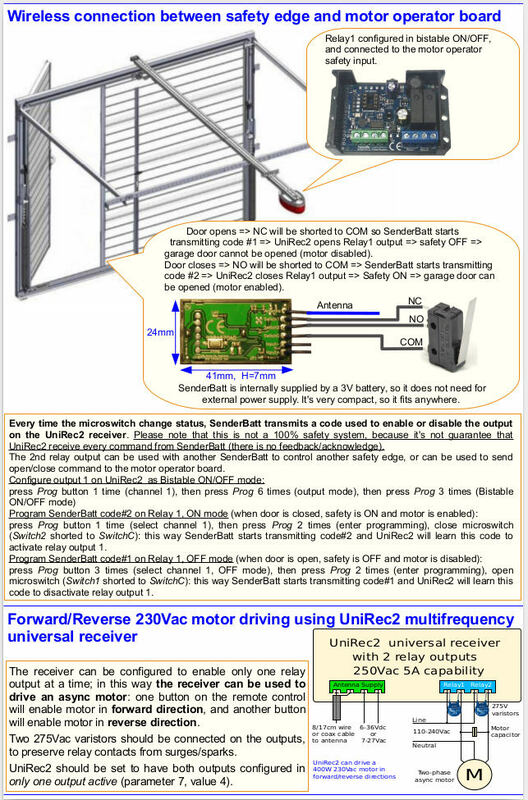 This is useful to directly control the two phases of an AC motor, to drive it forward and reverse.